As cartoon plutocrat and sentient overripe pear Donald Trump officially entered the Republican presidential race Tuesday, he pointedly brandished a financial disclosure statement that asserts his net worth to be in the neighborhood of 9 billion dollars. 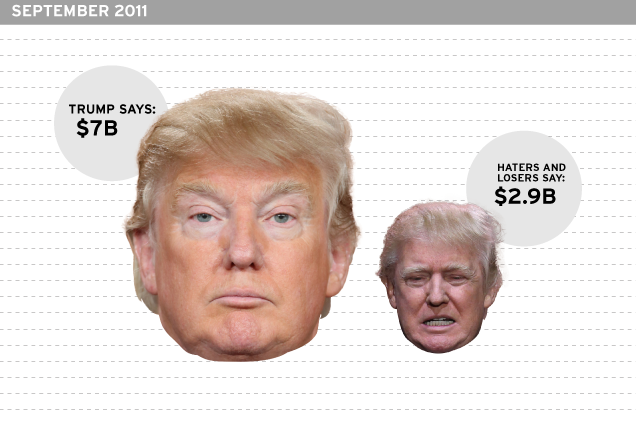 How much is Trump really worth? If history is any guide, the safe answer is: much less than he says he does. 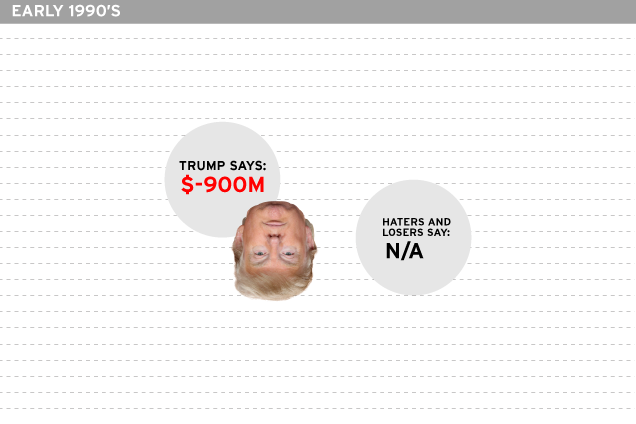 Here’s a timeline of how much money—visualized with the help of graphs—Donald Trump has claimed to have through the years, and how accurate those claims were according to the best sources available at the time. Trump had accounting firm Arthur Andersen—which would later be disgraced in the Enron scandal—audit his finances in 1988, revealing he had more than $700 million in cash and liquid assets. But according to Spy, which gleefully deflated many of Trump’s lofty public claims in the late ‘80s and early ‘90s, this was a neat deception. The Andersen audit took place a week after Merrill Lynch had given Trump $651 million to build his famous Trump Taj Mahal casino in Atlantic City, and it failed to note that all that cash was already earmarked for the project. Most of Trump’s remaining assets were in stock, but the accountants also didn’t point out that those shares were bought with borrowed money—he still owed $69 million. By Spy’s math, Trump was actually $20 million in the hole at the time. From the same Spy piece by John Connolly (coverline: “Was Donald Trump Ever Really Rich?”): Trump filed a sworn statement with New Jersey’s Casino Control Commission in March 1990, listing his assets at $1.5 billion. Also that March, divorce lawyers for The Donald’s then-wife Ivana Trump argued she was entitled to half of his assets—which they valued at $5 billion—in spite of their prenuptual agreement. Trump himself wouldn’t have gone as high as $5 billion that year, especially with the risk of losing half. This might be the only time he’s ever admitted he had less money than people thought. A few billion dollars and several strategic bankruptcies later, everyone still suspects Trump of exaggerating the hell out of his actual assets. At the time, he valued his largest asset, the still-under-construction Trump Place—which would eventually become Riverside South, the largest residential development in Manhattan—at $2 to $3 billion. In 2005, the development’s Southeast Asian financiers, Hudson Waterfront Associates, sold it for $1.76 billion. Trump sued, contending they could have gotten at least $3 billion, but his claims were dismissed. 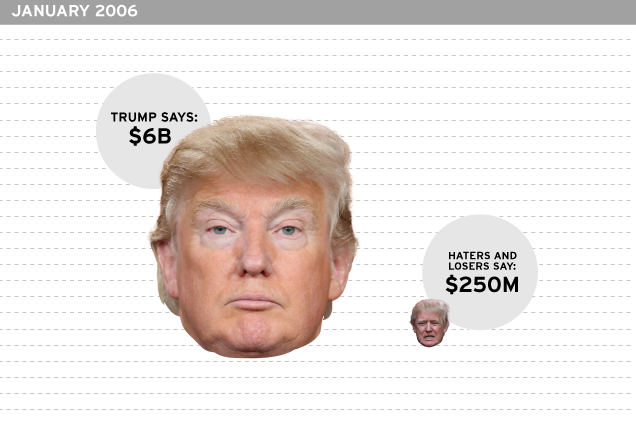 As of 2006, Forbes valued Trump’s stake in the West Side development at $170 million, far shy of the billions he expected it to bring in back in 2000. Estimate From the Haters and Losers: Less. “I would say six [billion]. Five to six. Five to six,” he said. Hmm. The previous August he told me that his net worth was $4 billion to $5 billion. Then, later that same day that August, he said his casino holdings represented 2 percent of his wealth, which at the time gave him a net worth of about $1.7 billion. 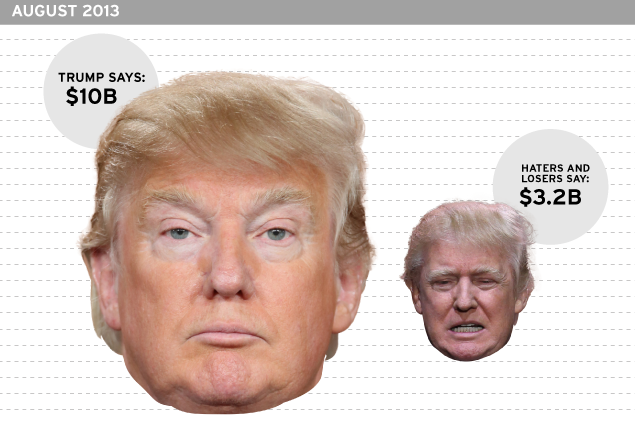 In the same day, Donald’s own estimates of his wealth differed by as much as $3.3 billion. How could that happen? Was Donald living in his own private zone of wildly escalating daily inflation, a Trump Bolivia? And his $1.7 billion figure in August was well below the $2.6 billion that Forbes would credit him when it published its rich list just a couple of months later. 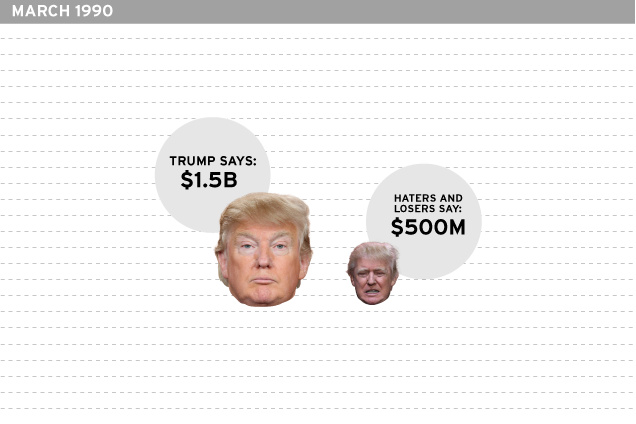 Now Donald was saying he was worth $5 billion to $6 billion. And on the nightstand in my bedroom at Donald’s Palm Beach club, Mar-a-Lago, was a glossy brochure that said he was worth $9.5 billion. That same year, Deutsche Bank did an independent evaluation of Trump’s net worth before giving him a $640 million loan to build condos in Chicago, the Wall Street Journal reports. They determined he was worth $788 million. 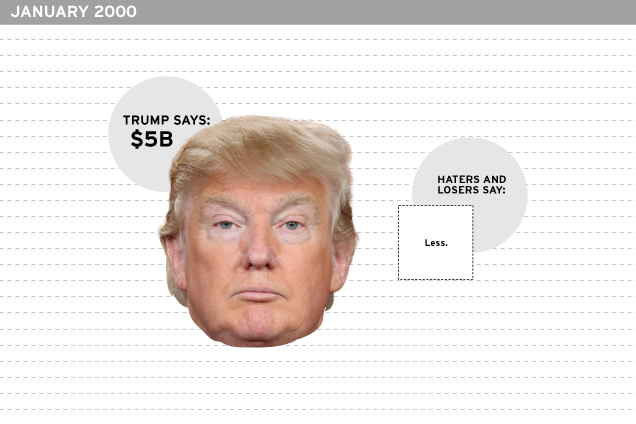 Estimate From the Haters and Losers: $788 million. Trump sued O’Brien for libel a year after his book was published, claiming his net worth was actually $6 billion, not the $150 to $250 million O’Brien reported based on sources who’d seen Trump’s finances. 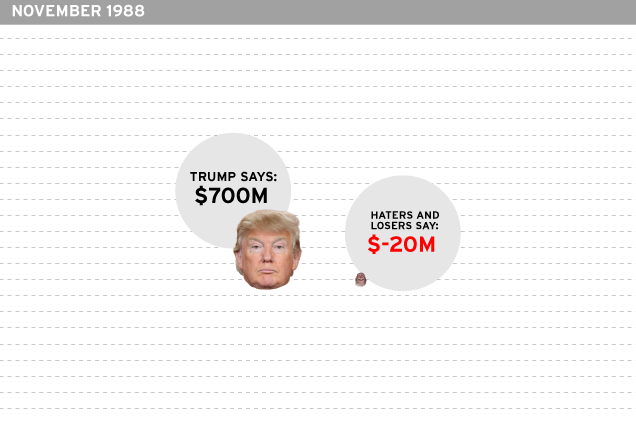 In the process of making his case, Trump cited that year’s Forbes list, which put him at $2.7 billion—lower than he liked to claim, but better than being a mere millionaire. 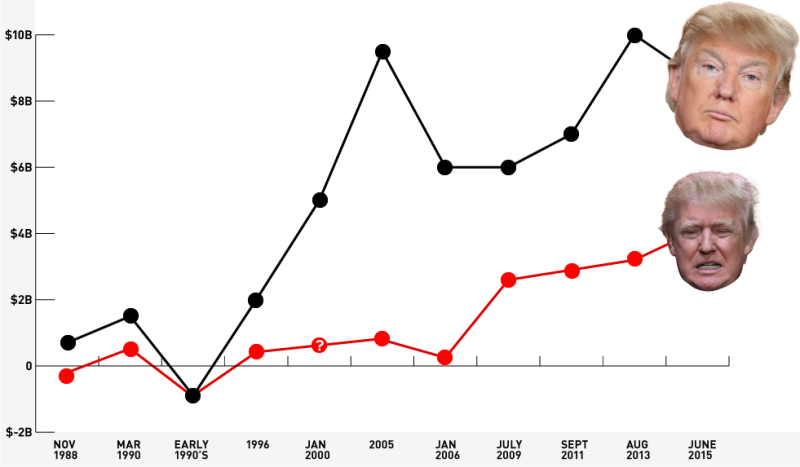 Is the Forbes figure accurate? O’Brien argues that Trump has always been the owner of “verbal billions,” whose bragging tends to blur the line between properties he’s built and properties he actually owns. 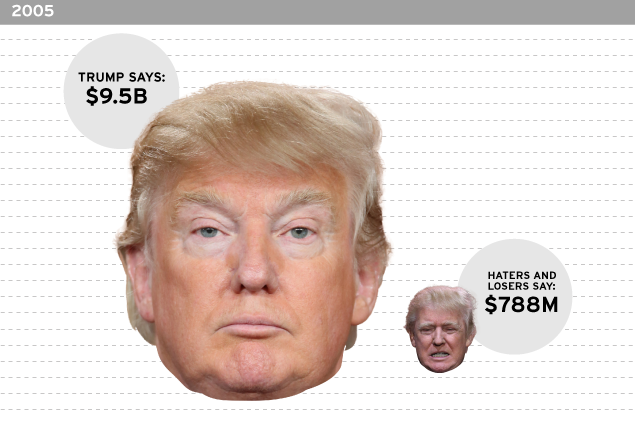 Although Forbes never credits him with the unbelievable numbers he claims, the magazine’s figures are nonetheless skewed because it’s forced to rely on the Trump Organization for information. Q: Let me just ask you first about the first sentence there: Trump relentlessly bloviating about his developments — this is going to be the biggest, best, most amazing — leads people to assume he exaggerates his net worth. Do you see that? Q: Do you know what bloviating means? A: Well, I’m not sure that there’s an exact definition, but I would imagine that’s what it means. Whether Trump’s estimations of his own net worth are lies, exaggerations, or fantasies he clings to, there’s no denying that he uses some unorthodox accounting methods in in determining them. In the same deposition, he claimed he’d done “mental projections” to arrive at the future value of one of his developments. Trump lost an appeal of his libel suit against O’Brien, and his lawyer told reporters his net worth had been “proven conclusively” to exceed $7 billion. The only good likely to come from another Donald Trump run for president (besides, of course, the Content) is the chance to study his public filings for information that could help us determine how many of his “verbal billions” are real, actual billions. 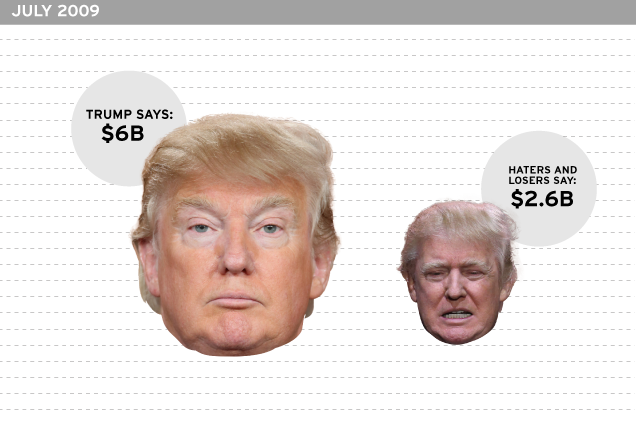 In the sparse document released (and waved around) Tuesday, Trump claimed a net worth of $8.7 billion as of June 2014. Second, in his list of liabilities, he counts loans and mortgages only on real estate owned 100 percent by him—and, as we’ve seen, much of what says “Trump” on it isn’t wholly owned by The Donald himself. “Typically Mr. Trump, having once lost his shirt, risks little money but earns a profit—paid only after lenders and partners get their money back—by acting as developer and promoter,” the Wall Street Journal noted in 2000. Forbes also argues that Trump is wildly overvaluing his clubs and his golf course chain—to the tune of about a billion dollars—and rightly declines to credit him $300 million for properties that haven’t been built yet. 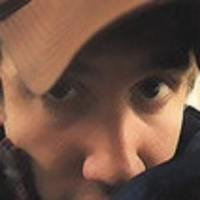 In terms of assets that can be confidently confirmed, Trump has $300 million in cash and securities, and owns about $3 billion dollars worth of real estate. 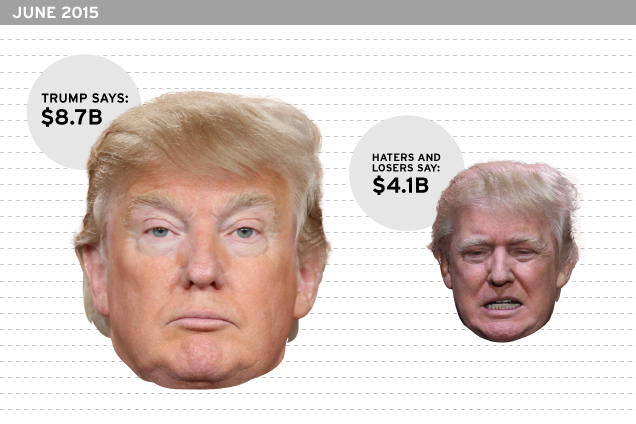 By their math, the math of the haters and losers of the world, Trump is worth 4 billion dollars, or less than half of what he claims.